The dominant country, in one of the most important regions of the world, experienced several years of tumultuous unrest, mass demonstrations, brutality, murders and chaos. This was followed by a parliamentary election, won by an extremist right wing party, whose demagoguery appealed to the lowest common denominator of the voters. The party received the largest popular vote and the largest number of seats in the parliament, but not an absolute majority. Its leader, formerly jailed by a previous regime, was installed as head of the government. The program of action of the new ruling party was sometimes openly declared, and often whispered in code language, but it was unambiguously stated in published books and documents prior to the election. It aimed at suppressing all competing political forces, by brutal means, if necessary. It also advocated the creation of a large “living space” for the people led by it, creating an empire, and controlling various territories in Europe that were formerly occupied by its allies. It advocated and practiced a strong policy of discrimination against minority groups, ethnic, religious and others, and it explicitly intended to murder the entire world Jewish population. The naïve democratic western powers largely ignored the clearly stated plans of the new ruling party. They talked themselves into believing that these were just an exaggerated form of political rhetoric, not meant as a real concrete strategy. They welcomed the democratically elected government, believing that the winning party had some components, which were not as evil as it might appear, and they remained passive as the new regime gradually proceeded with its agenda, step by step. This misguided western attitude was shared by conservatives, liberals and socialists, from the moderate right and moderate left in Western Europe and the United States. A year after the allegedly “democratic” ascent of the new government, a group of army Generals, with the active assistance of anti-government political forces, including many truly liberal supporters of real democracy, unleashed a bloody coup, removing the winning party and its leader from their ruling position. That was how the Second World War was averted by the military coup of 1934 in Germany, one year after Hitler won the 1933 democratic elections. Well, not quite. There was no coup, World War II did happen, tens of millions died, Europe and other parts of the world were destroyed, the aims of the ruling party were actually achieved, whenever possible, and the German Generals did not prevent it. Had the Generals attempted such a coup in 1934, would the President of the United States and various European leaders reprimand them and sanction them for toppling a democratically elected government? And, if so, how would history proceed? Would the German Generals be deterred by such unrealistic proclamations of the Western leaders? Or perhaps we should say surrealistic, rather than unrealistic? Would Hitler be reinstalled into power, courtesy of Roosevelt and the leaders of England and France? Your guess is as good as mine. We will never know. 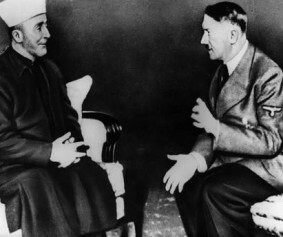 Throughout the entire Second World War, the leaders of the Muslim Brothers were active supporters of the Nazis. Their ideologies were, and still are, extremely similar. Some of their leaders lived in Berlin, for the entire duration of the war, as guests of the Hitler regime. They assisted the German war effort everywhere in the Middle East. 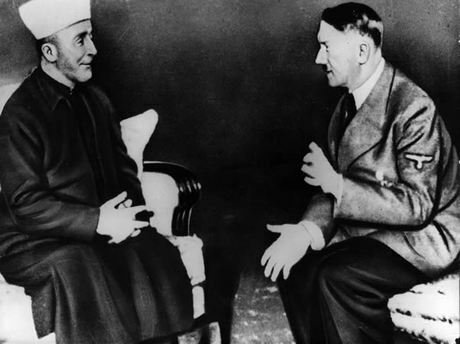 The German National Socialist movement and the Muslim Brothers were both born in the 1920s and had a close connection since that time. History can teach us many things. It often repeats itself, but never exactly in the same way. We normally learn from events that did take place, but we can also benefit by avoiding repetitions of missed opportunities. Please read again our opening paragraph. It accurately describes not only the events of 1933 in Germany, but also [those] of 2012-2013 in Egypt. There is no need to change one word in this long paragraph. All the details match, one by one, producing an amazing repetition of history. But in the case of Egypt, our second paragraph above, regarding the bloody coup of the Generals, did happen. It was triggered by mass demonstrations of the public, who realized that a democratically elected murderous dictatorship is not exactly an exemplary democracy, and the actual removal of the regime was implemented by the Generals. Somehow, in the age of twitter, when every profound idea must be expressed in terms of 140 characters or less, most of the western world tends to forget that democracy is more than just a one-time vote. It is a much more complex and demanding concept. Both in 1933 and in 2013, democracy is definitely not the act of electing a party that will never allow another election. It is not establishing a regime devoid of any freedoms–of expression, of the media, of religion, and of any other kind. Democracy is also not a lack of a proper judicial system. A democratic regime does not treat women as owned objects and does not kill gays, burn Christian places of worship and murder Jews as a matter of principle. But all of these features cannot be elaborated in a brief slogan, and it is much easier to be superficial and to pretend that democracy is going once to the polls. Based on these misguided premises, the Egyptian military coup appears as an anti-democratic act. And guess what? President Obama is applying enormous pressure, in order to help the deposed Muslim Brothers regime in Egypt. He punishes the Egyptian Generals, admonishes them for being against democracy, and essentially calls upon them to allow the Muslim Brothers to regain power. Amazingly, leading American Republican lawmakers support this questionable attitude. This is not only surrealistic. It is truly mind boggling. Naiveté? Unexplained weakness? Incompetence? Deliberate intent? Future historians will decide. Turkey’s properly and democratically elected Islamic regime has already put the top leadership of the Turkish Army in jail for life, silenced the judiciary branch and eliminated major dissenting media reporters, replacing all of the above by stooges of the ruling party. Indeed, an exemplary democratic system. Prime Minister Erdogan, the mastermind of all of these, is called “a very close friend of the President of the United States” and provides unlimited support to the Muslim Brothers everywhere. Qatar, a small dictatorship, hosting the American bases in the Gulf, and depending entirely on the US, is bankrolling the Muslim Brothers in many areas, from Syria to Gaza and definitely in Egypt. Its Al Jazeera TV has become the Muslim Brothers’ main public incitement tool, complementing the preachers in the Mosques, and spreading vicious and inflammatory propaganda. Spokespersons of the Egyptian counter-revolution, clearly supported by all truly democratic forces in the country, have now stated explicitly that they are essentially facing a strange coalition of President Obama, Prime Minister Erdogan and the Emir of Qatar, an amazing unholy trinity. In view of this, perhaps even the expression “mind boggling” has become an understatement. All friends of the United States in the Middle East are speechless, in view of the American behavior. They are all familiar with their geographic neighborhood and they certainly know the score. They know exactly who the Muslim Brothers are. Mutual antagonists like Saudi Arabia, the Emirates, Israel, Jordan and the Palestinian Authority (but, significantly, not the Muslim Brothers’ Hamas terrorists) watch the American and European reaction with disbelief and search for ways of opening the eyes of the western powers. Mr. Putin is already maneuvering to re-establish Russia’s dominant role in the Middle East, in view of the western follies. China, very thirsty for oil, is eagerly waiting in the wings, for the vacuum created by the US. Meanwhile, like Nero, the ancient Caesar, the “only remaining superpower in the world” is playing, while the entire region is on fire. Confused leaders of the European Union appear to be truly lost in the general melee of the Middle East and, for one reason or another, whenever two Muslim murderous forces clash, they always lean towards the Muslim Brothers, both in Syria and in Egypt. This bizarre attitude is, again, common to the Socialist French government and the Conservative UK and German leadership, who together send the inevitable Ms. Ashton to hold the hands of Mr. Mursi. Let there be no mistake: Assad is a brutal mass murderer and the Egyptian Generals mercilessly slaughtered many of their own people. No enlightened person should accept this. But that does not mean that their internal opponents come second in the vicious Olympiad of cruelty and atrocities. A diversified collection of samples: Former President Mursi appointed the mastermind of a murderous attack, which killed dozens of innocent European tourists, as the governor of a major district in Egypt; The Muslim Brothers are proud to have murdered President Sadat, who dared to regain the Sinai Peninsula for Egypt and made peace with Israel; A vicious murderer who approached a 79 year old holocaust survivor, resting on a bench in a park, and killed him with an axe, received a hero’s welcome by the Palestinian Muslim Brothers; More than twenty Egyptian policemen were pulled out of a vehicle, ordered to lie on the ground, and were murdered, execution style. The Western press does not show us photos of burning Christian Coptic Churches in Egypt, of weapon collections in mosques, and of frequent shooting at the police from the minarets of the same mosques. The treatment of Egyptian Christians by the Muslim Brothers’ government was in total disregard of any religious freedom, democracy or human rights, but, again, Europe was totally oblivious to that and remained silent. We are only exposed to a western media rendition of the standard Middle Eastern farce of theatrically staged photos: The same old Arab woman posing, with a threatening tank behind her, most likely produced by Photoshop, and the medical miracle of a severely wounded young man whose T-shirt is covered by fake blood and his torso, under it, is completely clean. It is “Business as usual”. All we can do now is hope that the western leaders will come to their senses, before the Muslim Brothers and their allies take over the Arab world and before Russia and China establish their power bases in the region. Unfortunately, the march of follies is progressing rapidly, in a very uncertain direction. “The excitement about the “first democratic election of the Arab Spring” has already led to the victory of the Islamists in secular Tunis, and that same Arab Spring is now well on its way to a hot suffocating Islamic summer. But the Western world, and its leader, President Obama, seem oblivious to the direction into which “the Arab Spring” is moving. Following the American treatment of Mubarak, and the almost absent reaction to Assad, all friends of the West in the Arab world, headed by the Saudi leaders, are now maneuvering in order to distance themselves away from the U.S. administration.